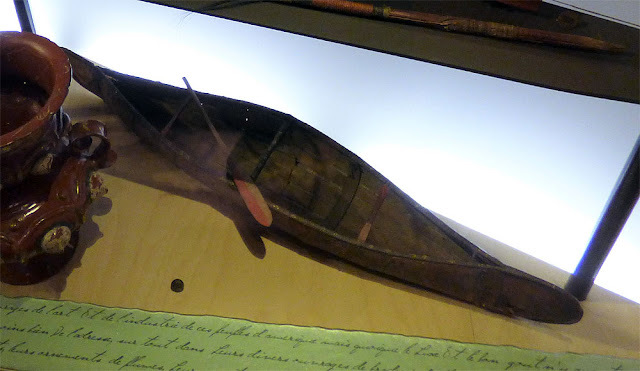 Found an image update of the the Mi'kmaq canoe model with decorated paddle at the Museum of Fine Arts - Rennes (original post here). As mentioned earlier, the model was assumed to be collected by Christophe-Paul de Robien (1698-1756), a French ethnographer and historian. After the French Revolution, his personal collection inherited by his descendants was seized by the State and distributed to what became the Museum of Fine Arts of Rennes. During that inventory process, it was inscribed with a date of 1794 but the original construction date is likely earlier. Accompanying the canoe is a single paddle with a pole grip and a decorated blade. Although faded, it appears that half the blade was painted with a red pigment creating a simple "yin/yang" effect. Robien's curiosity collection is on exhibition at the Museum. A virtual tour and description (in French) can be read on this blog post here. Tucked on a bottom shelf is the canoe model with the dual toned, pole grip paddle displayed on top.